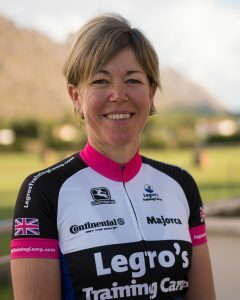 Claire has been coming to Majorca every year to train since taking up cycling in 2003 and knows the island well. Claire has regularly worked as a group leader for the last 4 years on major endurance events and training camps. She has competed nationally at time trials since 2003 from distances from 10 to 100 miles. A qualified British Cycling Level 2 Track Coach, ABCC Level 3 and a level 5 Soft Tissue Therapist. Claire worked as a freelance Soft Tissue Therapist alongside physio’s specializing with Sports Injuries, spinal injuries, neurological and debilitating conditions. This was also balanced with coaching at Lee Valley Velodrome. Claire has also tried out racing on the track and achieved silver and bronze at the National Masters 2015.